The identities and backgrounds of the terrorists who assaulted Charlie Hebdo, a French magazine, are still unknown. The Long War Journal cautions against drawing conclusions at this early stage. As of this writing, the terrorists responsible have not even been apprehended. And speculation concerning the circumstances surrounding a terrorist attack has proven to be wrong in the past. We do know that the magazine, which has published satirical cartoons of the Prophet Mohammed, but also personalities from other religious traditions, has been repeatedly threatened by jihadists. Al Qaeda has taken notice of the magazine, arguing that members of its staff should be targeted for their role in publishing controversial material. 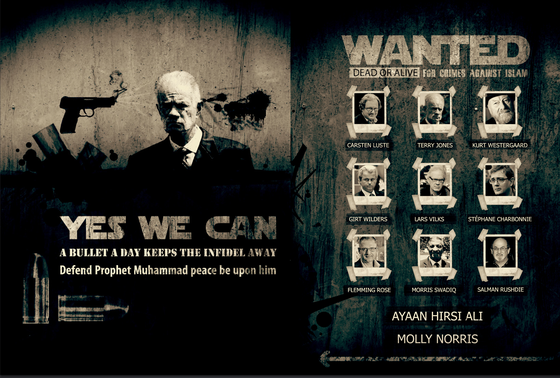 The tenth issue of al Qaeda in the Arabian Peninsula’s Inspire magazine, for example, includes a “Wanted” poster that is headlined, “Dead or Alive For Crimes Against Islam.” The poster is intended to encourage followers to shoot eleven people, all of whom have supposedly offended Islam. One of the men listed is Stephane Charbonnier, the editor-in-chief of Charlie Hebdo. According to news accounts, Charbonnier was killed during today’s attack. He had been living under police protection because of previous threats against his life. Citing a witness to the terrorist attack, the Telegraph (UK) reports that the terrorists responsible said they were from al Qaeda in Yemen. The SITE Intelligence Group points out that jihadists from other groups, including Ansar Bayt al Maqdis (ABM) and Tehrik-e-Taliban Punjab, have also taken note of the French magazine. A faction of ABM in the Sinai has sworn loyalty to the Islamic State’s Abu Bakr al Baghdadi, while other parts of the group reportedly are loyal to al Qaeda. The magazine has also poked fun at the Islamic State, which claims to rule over a “caliphate” stretching across portions of Iraq and Syria, and its emir, Abu Bakr al Baghdadi. Again, it is too early to tell if the terrorists were members or followers of al Qaeda, the Islamic State, or completely separate from those two groups. The Long War Journal is not drawing any conclusions based on previous threats. More evidence is needed to firmly establish the terrorists’ identities. According to a witness they spoke perfect French and said they were from Al Qaeda. “Rocket launcher” too? Not a grenade launcher/RPG, but a real antitank weapon?? While this attack was apparently inspired by Al-Qaeda, it seems to me that these types of attacks are becoming much more epidemic now in the ISIS era, making me wonder if it is the ISIS spirit that is really provoking these attacks at an alarming rate. Or is Al-Qaeda trying to inspire attacks like this in order to keep pace with ISIS? It seems like these things are happening all the time now (recalling the attack in Sydney …) more so than they ever were in the pre-ISIS days, unless my memory is failing. What a sobering day for Europe, which has already been on edge about their Islamist radical problem. Good questions and observations. I see nothing at all in common between this attack and Sydney, except the religion of the attacker. That was a “loon wolf” attack on a random soft target. This wasn’t IS-inspired or IS anything (they’ll hit later and take credit for it, mark my words). This was classic core AQ (probably AQAP if the terrorists themselves are to be believed), going for a clearly identified and oft-threatened target, which even a plainclothes police detail could not protect. Carefully planned and devastatingly lethal; very “surgical” too, if you care about such things.